Leonid, 26, Anatol. 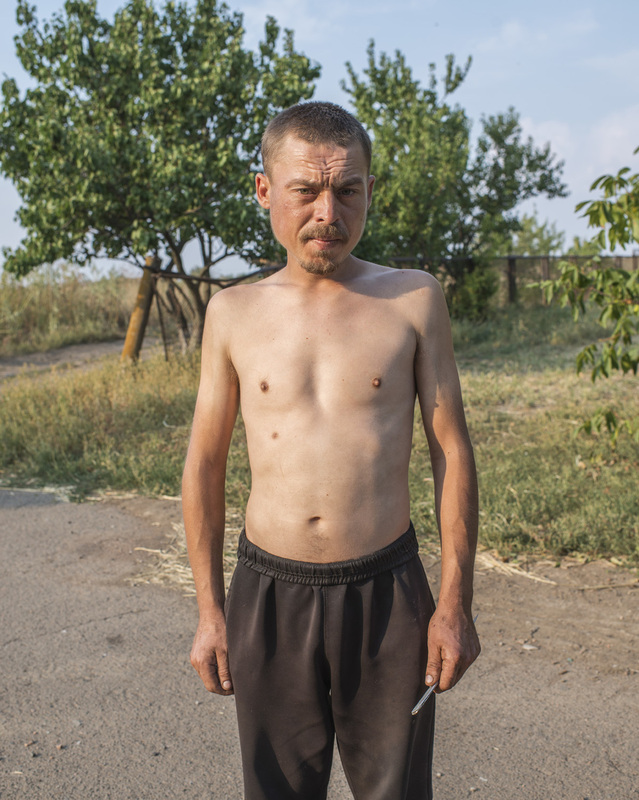 "If the shelling comes here we can do nothing, it's heavy artillery you can't really hide." Tank traps in a field in eastern Ukraine. "We repaired this pothole a year ago, now we're repairing it again. Prices are going higher and it's very hard for young people to find work. I worked in the coal mine before I retired. This town was built around coal mines, but when the war started a lot of people left. Nobody knows if the ceasefire will last but I hope the shelling will stop." 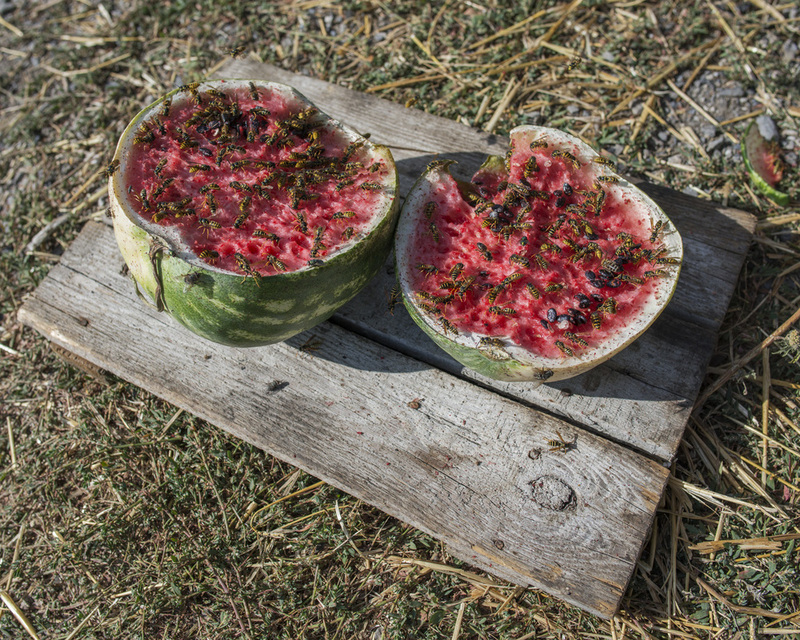 A watermelon sits split in half by the side of the road. "Why should I support the soldiers? They are somebody's children but the other side are also somebody's children. I want to cry." "I used to have a goat but I killed it to eat and now I use its pen as a shelter. It was once 48 hours of constant shelling. When you go outside you're still nervous, you're always waiting for the shelling to start. Everyone's scared now, everyone waits for the shelling. I can't sleep very well at night, if I hear a sound, like a truck going by, I can't sleep at all." Marie, 70, lives in the government-assisted shelter Collective Center in the city of Mariupol after fleeing shelling in the east. "This kitten is named Mariska. She heals me by taking away bad energy." A soccer ball punctured by shrapnel in the village of Pisky. An improvised explosive device detonates during Ukrainian volunteer military training in the east. 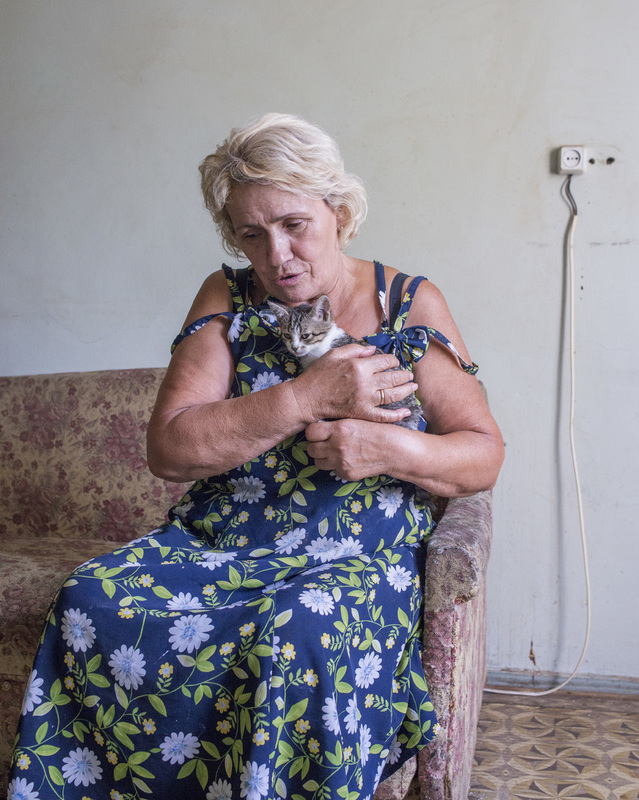 Lyubov, 64, fled shelling in Donetsk to stay in a government-assisted shelter in the city of Mariupol. A man in the government-assisted shelter Collective Center in the city of Mariupol. An apartment building in the town of Avdiivka. 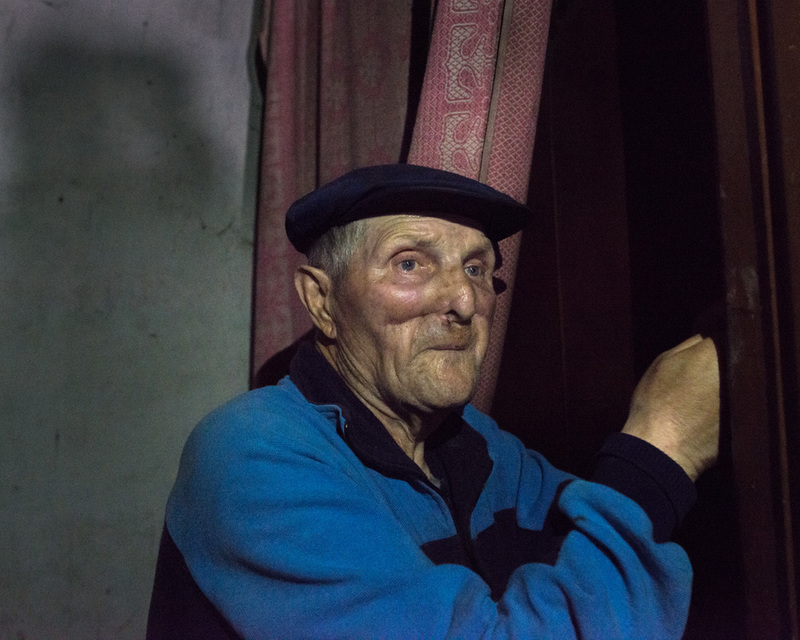 In mid-2014 Avdiivka was seized by separatists and subsequently reclaimed by Ukrainian forces. "My apartment was shelled, I was outside cooking when it happened. I came in and I was shocked, everything was on fire, everything was destroyed. Now I live in a smaller apartment down the hall, my neighbor gave me a sofa and table to use. My documents were destroyed in the explosion. Now I only have photocopies, if I can make a little money I'll try to get a new passport made if it's possible." "I was outside when a rocket landed. A piece of shrapnel tore off the front of my face. I was taken to the hospital in Krasnoarmisk and they sewed it back on, I eat through a tube now. I was in the hospital for a month and while I was there thieves broke into my apartment and took everything. Medicine is very expensive and my pension is very small. My pension was larger but it was cut. I go to beg for food from the soldiers every day. It would be better if the shell had killed me because this is not life." Sergei's stockpile of wood in Avdiivka. With coal and gas costs rising many are worried about how they will stay warm during winter. Some have begun chopping wood to burn in preparation. "This winter will be very difficult for people. For retired people it will be impossible to heat their homes. I think there will be a new Maidan when it starts to get cold and people have no heat." A bare cupboard in the village of Gnutove. Food prices have skyrocketed and deliveries to stores near the front line have grown less frequent. Increasingly, people must rely on food they've stored or are able to grow themselves. An already abandoned trench cuts through a farmer's field. "Before the war my husband had a field planted with sunflowers. Now tanks drive across the field, they dig trenches. My husband can't plant anything." "There are land mines in the fields now! How can we use the fields next year? Everyone's scared of the land mines." 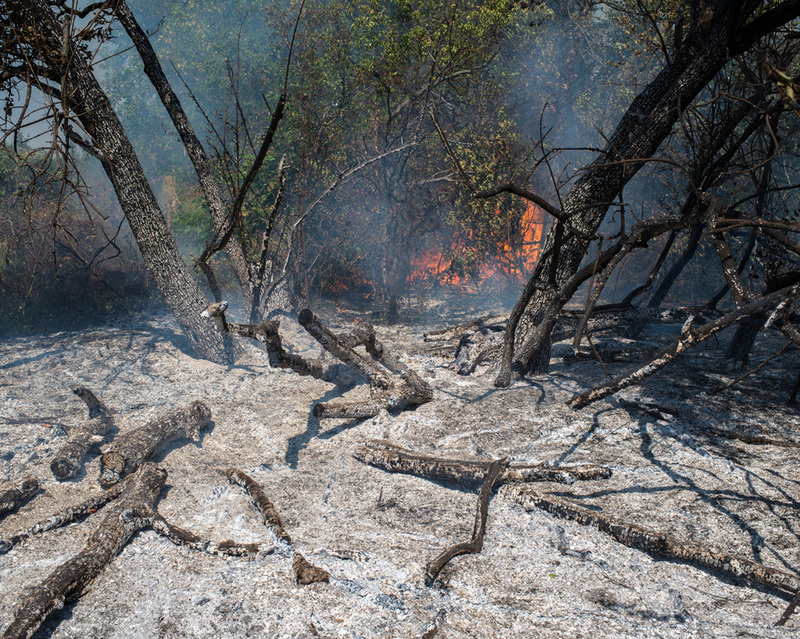 A forest fire near the frontline in east Ukraine.